~ EMS adjustable function: each article has its suitable emissivity, the adjustable emissivity function can make the test more accurate by adjust suitable emissivity for different articles. ~ Measures in Celsius or Fahrenheit (Range: -50°C to +380°C /-58 °F to +716°F). 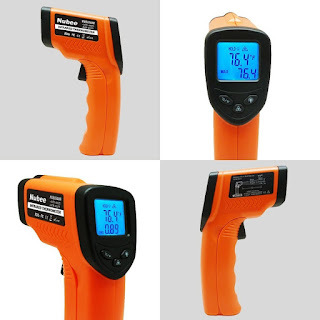 Auto Shut-off & Low Battery Indicator, take accurate temperature readings with this handheld gun. or at the correct temperature you need? Do you like to put your bare hand on a potentially hot surface to check? Or how about holding a thermometer near something still radiating heat? 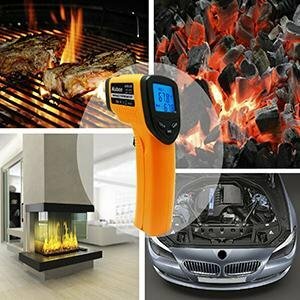 With this Infrared Digital Thermometer it is easy and safe to check the temperature of nearly any item with little to no risk to our personal safety. I tried it on my cooked food to see if the external temp was what it should be. I tried it with my husband's grill to see if the thermostat was correct (he has some hot spots and some cool spots), and also tried it out on my kiddos to see what their body temperatures read (works pretty well - all are healthy and normal so far). I was pretty impressed with the amount and variety of items I can use an infrared thermometer for. I really wasn't sure what to do with it for this review until I started doing some research and playing around with it. It is definitely something I will continue using frequently and keep on hand to keep myself and my family safe from burns.